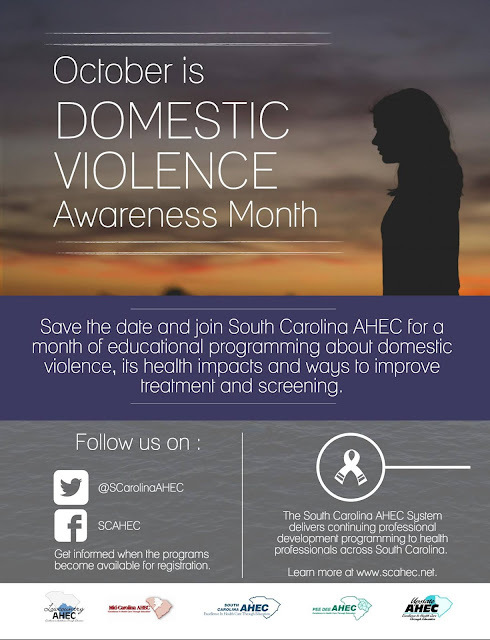 October is National Domestic Violence Awareness Month and the South Carolina AHEC System is marking the month with a series of programs focused on domestic violence, its health consequences and ways to improve screening and treatment. Programs will be available both live, via video conference, and recorded for on-demand access through AHEC U. A variety of continuing education credits will be available. Follow the South Carolina AHEC on Facebook and Twitter and be the first to know when the programs are available for registration.